Capacity 1298 cc / 79.2 cu in. Bore x Stroke 80 x 64.3 mm / 3.15 x 2.53"
Front Wheel Travel 115 mm / 4.5 in. 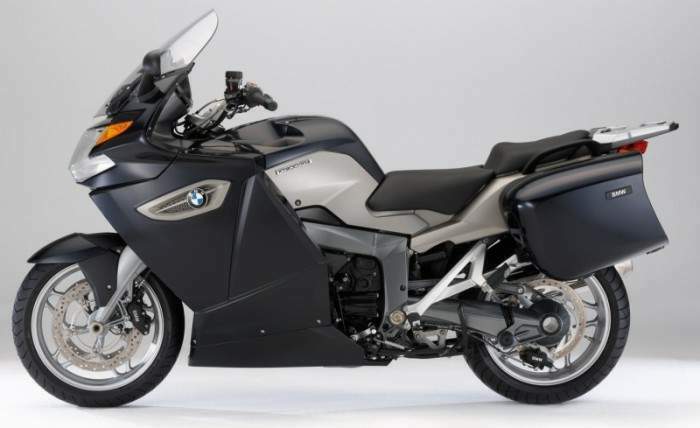 Introducing the new K 1300 GT, BMW Motorrad is opening up new dimensions in the BMW Touring Encounter World in terms of both riding dynamics and grand touring qualities, enhancing the Company’s worldwide leadership in the Dynamic Tourer segment. Offering even greater supremacy all along the drivetrain, an even higher standard of quality, an aerodynamic fairing enhanced to a new level of perfection, and a wide range of special equipment, the new K 1300 GT stands for Gran Turismo of the highest caliber. It combines maximum agility and sporting riding dynamics with the ideal package for long tours. And with its engine output 118 kW (160 hp), together with maximum torque of 135 Newton-meters (99 lb-ft), the new K 1300 GT also benefits from the increase in engine size and stands out as one of the most powerful motorcycles in its segment. In typical BMW style, therefore, the new K 1300 GT meets the greatest demands in terms of riding dynamics, comfort, safety, and equipment. The new K 1300 GT is a High Performance Tourer featuring the innovative and proven highlights of the new K 1300 S in terms of performance, riding safety and technology. The drivetrain and suspension come largely from the K 1300 S, but have been adapted in their specific features and details to all the requirements of a dynamic tourer. 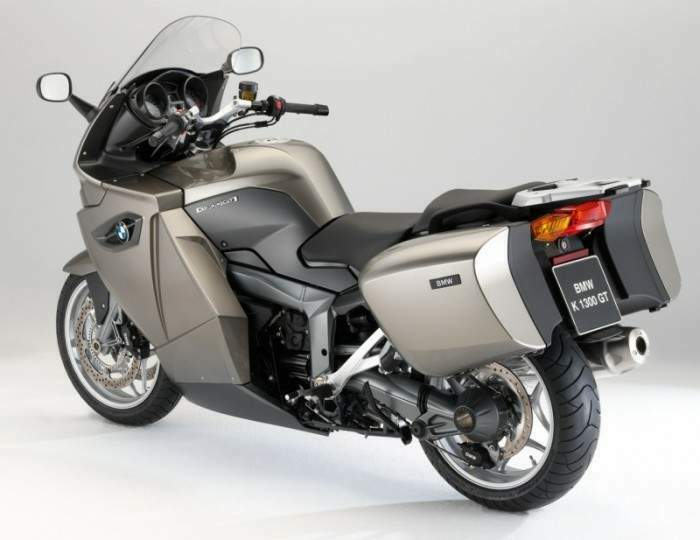 The highlights in developing the new K 1300 GT were enhanced riding dynamics and even greater supremacy combined with outstanding comfort and optimum qualities for all kinds of motorcycle tours. Identical in its basic features with the power unit of the K 1300 S, the engine has been modified in terms of air flow and guidance. This increases maximum output over the K 1200 GT by 6 kW (8 hp) to a new record level of 118 kW (160 hp), with even greater emphasis given to superior torque for even better traction and pulling force at low and medium engine speeds. 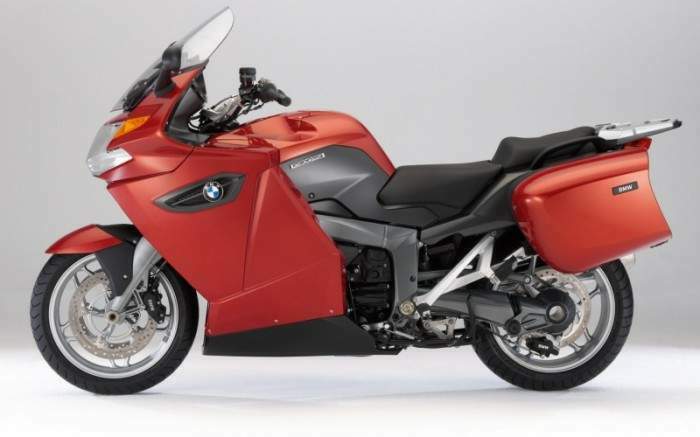 The K 1300 GT also sets the standard in terms of comfort, riding safety and equipment, not only through its excellent suspension and running gear, but also through optionally available, electronically adjustable ESA II (Electronic Suspension Adjustment II) as well as features such as electronic cruise control, an electrically adjustable windshield, or seat heating controlled individually for the rider and passenger. Even more traction and pulling force, particularly at low and medium engine speeds, through the increase in engine capacity. Engine output 118 kW (160 hp) at 9,000 rpm, peak torque of 135 Newton-meters (99 lb-ft) at 8,000 rpm. Significant increase in torque from 3,500 rpm. Fulfillment of the strictest environmental standards through newly set-up Digital Motor Electronics. Optimization of the emission system through rear mufflers modified inside and a fully-controlled three-way catalytic converter. Desmodromic operation of the gas lever function for even better and more precise gas metering. Optimized, maintenance-free shaft drive with a new, two-stage drive shaft. Even greater driving precision and optimized response combined with maximum riding stability ensured by the optimized Duolever front-wheel suspension complete with a newly designed lower longitudinal arm. Second-generation ESA II Electronically Adjustable Suspension and ASC Anti-Spin-Control as an option. New, innovative generation of switches and controls with optimized ergonomics. Integral ABS (semi-integral) featured as standard for a high level of active safety. Wide range of equipment and accessories tailored to the new machine at BMW’s usual high level of perfection. Seat and handlebar are adjustable. Like the K 1300 S, the new K 1300 GT also benefits from the significantly upgraded straight-four power unit increased in capacity from 1,157 to 1,293 cc. Maximum output is now 118 kW (160 hp) at 9,000 rpm, with peak torque of 135 Newton-meters (99 lb-ft) at 8,000 rpm. This equals an increase in power by 6 kW (8 hp) and an increase in torque by 5 Newton-meters or 3.7 lb-ft. While the former K 1200 GT did not develop its maximum output until 9,500 rpm, the power unit of the new K1300 GT offers its maximum power at 9,000 rpm, with more than 80 per cent of the engine’s maximum torque available from just 3,500 rpm. Again versus the K 1200 GT, the torque curve is significantly better over a wide range from 3,500 – 10,000 rpm, following the objective to offer significantly more traction and pulling force particularly at low and medium engine speeds. The torque curve remaining at a high ceiling over a wide range of engine speed is indeed virtually ideal for the K 1300 GT as a genuine Gran Turismo, offering even more practical performance and supreme power than its predecessor, which already set the standard in this segment. While all features optimized on the engine and drivetrain of the new K-Series also benefit the new K 1300 GT, the airbox has been specifically adjusted to the different air requirements and flow conditions within the engine, featuring an optimized air filter and newly set-up intake funnels versus the former model. The rear muffler, which is newly designed and configured, also contributes to the even “beefier” torque curve and enhanced riding qualities of the K 1300 GT, standing out clearly through its supreme and powerful rumble. Contrary to the very sports-minded K 1300 S and K 1300 R, the exhaust system on the K 1300 GT with its substantial damper volume and consistent use of stainless steel throughout does not require an electronically controlled exhaust butterfly. 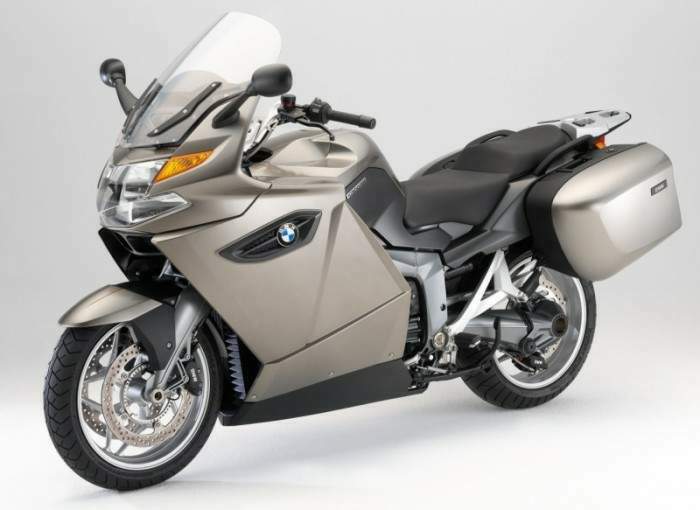 The BMW K1300GT does not have the new BMW Gearshift Assistant feature. It uses an optimized anti-friction bearing on the gearshift lever with a corresponding reduction in tolerance in the transmission of power ensures an even more precise and faster gearshift than ever before. While the new K 1300 GT is based on the particularly stable suspension geometry of its predecessor, the unsprung masses of the BMW Duolever have been reduced even further through the introduction of a newly designed lower longitudinal arm. Now made of forged aluminum, the new Duolever gives the motorcycle an even smoother and finer response. BMW’s new ESA II (Electronic Suspension Adjustment II) suspension is also available on the K 1300 GT as an option at extra cost. This allows the rider, apart from the damping on the two spring struts, to also adjust the spring base (spring pre-tension) on the rear spring strut as well as its spring rate and spring hardness smoothly and conveniently at the touch of a button. Hence, the owner is able to set the suspension most conveniently and more precisely than ever before to their personal wishes, taking particularly the load the motorcycle is carrying into account (which is of particular significance with the K 1300 GT) and offering a new dimension of riding stability combined with optimum response under all riding and load conditions. ESA II is the world’s first electronic suspension control on the motorcycle offering such a wide range of adjustment options. The new K 1300 GT is equipped with BMW’s proven EVO brake system also featured on the other models in the K- and R-Series. Brake discs measuring 320 millimeters (12.6") in diameter up front and 294 millimeters (11.6") in the rear guarantee optimum deceleration also from high speeds and under maximum load. Featured as standard, BMW Motorrad Integral ABS (semi-integral) not only fulfils the highest demands in terms of safety, but also caters for the wishes and preferences of the sports-minded rider through its special set-up and configuration: BMW Motorrad Integral ABS controls the front- and rear-wheels brakes through the handbrake lever, while the footbrake lever acts only on the rear-wheel brake. The new K 1300 GT boasts a brand-new generation of switches and manual controls. Using MID (Moulded Interconnect Devices) technology, the new switch and control units are far smaller and more compact, while at the same time offering a higher standard of functionality, clear design and optimum accessibility. The switches for the electrical adjustable windshield, the handle and seat heating as well as cruise control are all integrated in the control units on the K 1300 GT. Like the K 1300 S, the new K 1300 GT comes with a newly designed speedometer and rev counter with an even more dynamic layout on its scale. These two units are supplemented in the digital instrument cluster by the Info-Flatscreen, an information display consistently providing all the information the rider requires on data such as coolant temperature, tank capacity, the time of day, or the gear currently in mesh. When fitted with ESA II (Electronic Suspension Adjustment II) as an option, the flatscreen provides additional information on the current suspension setting. Other data available on request are the current mileage of the motorcycle, trip mileage and – once the fuel level has dropped to reserve – the remaining range. Any deficiencies or defects, finally, are shown in the display by appropriate signs and symbols. The unusually slender full-fairing with its dynamic contours and excellent aerodynamic qualities has been carried over from the former model and upgraded in its looks for the new K 1300 GT. The new fairing differs from the former unit at the side through an opening in the side panel and the logo support, giving the K 1300 GT a far more dynamic appearance. The inner surfaces of the fairing now fully painted and no longer in the conventional grain touch convey an even higher standard of quality and style. And at the same time the inner surfaces are further upgraded by the instrument panel now finished in a matt, dark metallic color. Protectors integrated in the side sections reduce the risk of damage in a fall or accident. Hence, the machine is now well protected should it fall over in an accident or when not properly parked. The new K 1300 GT comes with the electrically adjustable windshield already featured and proven on the former model, combining optimum protection from wind and weather with minimum dimensions. Through its aerodynamic design and configuration, the windshield guides the wind rushing by round the rider, relieving his head and upper body of wind pressure also at high speeds. 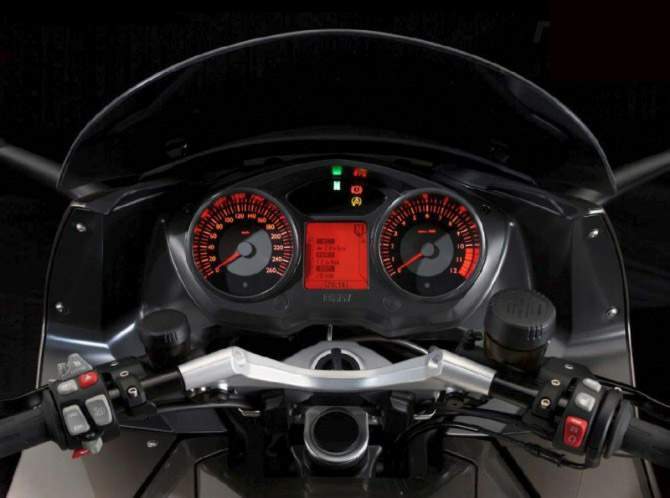 A further important point is that the windshield may be adjusted electrically over a range of 100 millimeters or almost 4 inches from the left handlebar controls, thus consistently meeting the rider’s requirements. A higher windshield (+ 60 mm, almost 2.4") is available as an optional extra, offering virtually every rider perfect protection, regardless of his size and riding position, simply by choosing the right windshield and adjusting it accordingly. To ensure maximum comfort and freedom of movement, the seat, as on the former K 1200 GT, is designed around the so-called step arch length of the rider as the decisive criterion for seating quality. This particular measurement is the distance between the rider’s two feet on the ground – measured across the inside of the legs – also taking the shape and the width of the seat into account. The seat is tapered significantly around the rider, enabling him to comfortably place both feet on the ground and bend their knees just as comfortably. A further point is that seat height may be adjusted as required to 820 or 840 millimeters (equal to 32.3 or 33.1"). And for the somewhat shorter rider BMW Motorrad offers a lower seat as an optional extra measuring 800 millimeters or 31.5" in height (adjustable to 820 mm or 32.3”). Both with a sporting style of riding and when touring, the “ergonomic triangle” made up of the footrests, the seat and the handlebar guarantees maximum freedom of movement as well as a relaxed style of riding without the slightest fatigue. And last but certainly not least, the passenger will also enjoy the high standard of seat comfort so typical of a BMW. Handlebar adjustable for height. As on the K 1200 GT, the handlebar is adjustable for height in four levels, covering a total range of adjustment towards the rider’s body of 40 millimeters or almost 1.6", thus adapting to all kinds of riders of different size and allowing the rider to choose their ideal seating position at all times. The height of the handlebar is adjusted very conveniently and easily through a mechanical thread-and-bolt setting. The new K 1300 GT stands out as a genuine Gran Turismo through its ideal combination of sporting performance and touring comfort provided right from the start even in standard trim. And to raise this standard to an even higher level, BMW Motorrad offers a wide range of optional extras and special equipment, optimizing this Dynamic Tourer in every respect. These features will thrill both the demanding Grand Touring rider looking for maximum comfort on long distances and the technology enthusiast in search of innovative technical features. The wide range of functional options extends from an on-board computer through a xenon headlight all the way to the ESA II (Electronic Suspension Adjustment II) suspension allowing the rider though simple and optimum adjustment of the spring and dampers to set the running gear to the rider’s current requirements. Optional extras come straight from the factory and are fitted during production. 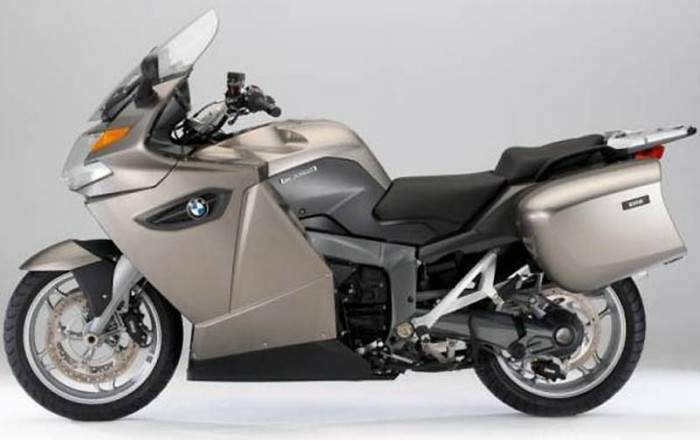 Special equipment is fitted by the BMW Motorcycle Dealer also subsequently after the motorcycle has been delivered. The new K 1300 GT offers perfect harmony of touring qualities and sporting riding dynamics – features also reflected by the design of the K 1300 GT with its flowing lines and clear, striking shapes and surfaces. The lines tapering out towards the front symbolize even more power and dynamics than before, combined with sporting and slender all-round proportions. The three main colors available for the body are Red Apple Metallic, Royal Blue Metallic, and Magnesium Beige Metallic, contrasting perfectly with the drivetrain finished in Black and the suspension components in Asphalt Metallic. While Red Apple Metallic in conjunction with dark contrasting components on the spoiler and at the rear appeals particularly to the sporting and ambitious rider, the experienced touring rider will definitely enjoy Royal Blue Metallic with White Aluminum contrasting components as a puristic alternative. A third variant offers an even higher level of elegance and modern style: Magnesium Beige Metallic contrasting with Dark Slate Metallic, matt. ESA II (Electronic Suspension Adjustment II; new). Low rider’s seat (approx 800 mm/31.5" adjustable to 820 mm or 32.3", step arch length 1,760 mm/68.9"). On-board computer including oil level warning unit. Watertight tank bag including fastening elements. Sports soft bag, small 19 Litres/large 51 Litres. Watertight luggage roll, 53 Litres, including lashing belt with tightening lock. Impact protector for system cases, left or right. Inner bag for system cases, left or right. Top case, large, in white aluminum, 49 Litresincluding attachments and locking cylinder. Top case, small, 28 Litresincluding attachments and locking cylinder. Inner bag for top case, large/small. Back padding for top case, small. Heated grips with control unit. 230 V/110 V battery charger including adapter. Repair kit for tubeless tires. Repair instructions for K-models, DVD. LED light for on-board socket. BMW Motorrad ZUMO navigation and communication unit including holder (new).